If you’re already a coupon user, the idea of grocery savings is not new, but there is always room for improvement for an even lower budget. If you’ve scoffed at couponing before, I hope the last few weeks at looking at your finances has opened your eyes to new opportunities for budget savings. From online coupon codes to clipping coupons to printable coupons, stores & manufacturers are constantly throwing free money to savvy consumers. Once you learn a few extreme couponing skills—no, not that extreme—you’ll be able to greatly reduce your grocery budget to free up funds for other spending categories, vacation savings or debt management. When I first learned how to coupon, back in college, the savings became my entertainment budget. If I saved a few dollars on things I was already buying, I could afford an evening at the dollar theater. If I saved even more, I had the money to join my friends for dinner first. Eventually, my weekly shopping list came straight from the sales fliers, and trimming our grocery budget became a way to afford a better lifestyle. But, even I have room for improvement. I get lazy, my coupons become disorganized, and I order from Amazon without a second glance at other sites & available coupon codes. This month, I’m getting back in the game—and I plan to win! I’ve cleaned out my pantry, organized what’s left of my stockpile and I’ll be regaining control of my coupon binder. Your challenge for today: If you are already a coupon user, sort through your coupon stash. 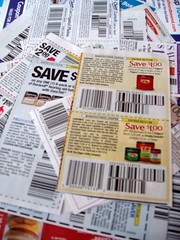 Toss expired coupons, organize recent coupons & bring awesome ones to the forefront so you won’t forget to use them! If you are a new coupon user, decide on a coupon organization system that works for you and start collecting coupons to use with your next grocery shopping list. Then, decide what you’re going to do with all that extra money!